They can be placed next to each other or carefully linked together using sneak-clicking - just the way you want them to! They can be disconnected and reconnected using Wrenches! Their backend code is probably a fair bit cleaner. Minor tweaks, such as larger chests having a slower opening animation and deeper opening/closing sound over regular chests. Unlike existing "alternate chests" mods, this one retains full compatibility with other mods' crafting recipes - even ones which don't have the chest in the ore dictionary! This means that you need eight of the same wood type to make a chest. This may cause issues in edge cases while using autocrafting storage networks. Loot chests and village chests still generate using the "classic" vanilla-style chest. This may be changed at a later point in time. 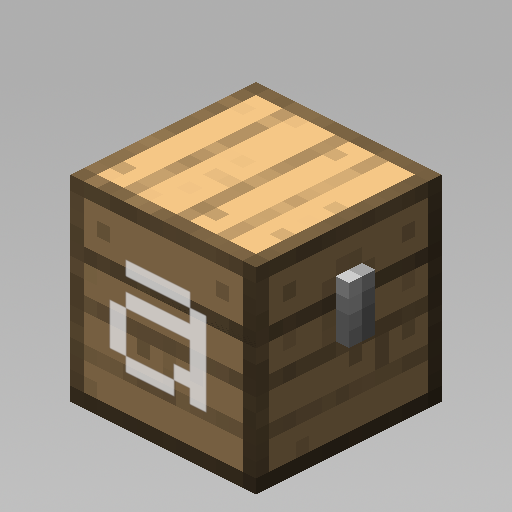 The texture generation algorithm for the chests is still a work in progress, so the specific coloring may change somewhat. Upon further inspection, the problem only occurs when using a certain resource pack. That being, Lithos:Core 32x. Using any other resource pack seems fine. I can't figure out what's causing it. I have 2 wrenches available to me in a personal modpack I put together, Ender IO & Refined Storage. Neither one of these would work to connect/disconnect the chests. I tried a multitude of click/key combinations. Are these incompatible or am I doing something wrong? The wrench should provide a tool class of "wrench"; in addition, sneak-clicking should be used. If the wrench does not provide a tool class of "wrench", it's likely to be a bad wrench and should be wrenched better. So apparently I have inferior tools. Noted. Might I make a small request then? Would it be fair to ask for a wrench that works on your modules - barrels, chests, crafters - included possibly in the .lib module with a config option to enable or disable said wrench so that people like myself can fully utilize the features of your mods? As a side note, I think you have done a wonderful job with these and I really like the way they look and feel. The carry module in my opinion is done perfectly, with a whitelist as opposed to a blacklist, so I am never accidentally picking up things I never wanted to pick up. Hope to see more in the future. Unfortunately, I have more or less ceased working on my 1.12 mods for now - seeing as I am focused on Fabric at this time. Very sorry to disappoint in this regard. Hey Asie, I've got an issue with compatibility to look over. I am unable to use a chest transporter from "Chest Transporter" to pick up and move any charset chests. Chests from other mods work just fine like the ones from MetalChests and Thaumcraft but anything from charset simply does not work, it just opens the inventory you are trying to pick up. I think I remember seeing this as an issue on the Chest Transporter comments as well but it doesn't seem like anything got fixed from that disscussion, I'd love it if this could be worked out. Because Charset Chests re-implement chests to provide the 1.13+ placement functionality, they will not work with mods which only support vanilla and vanilla-derived chests. i recommend using a different transport mod which supports such functionality - my personal preference is using Charset Block Carrying to put chests into minecart trains, but others might not like the idea very much... Sorry. I can confirm I was the one who reported the issue on Chest Transporters page! I can only seem to make chests out of vanilla wood and quark color-stained wood; all other planks don't seem to craft into anything and there's nothing listed in JEI. 1. Run "/ch hand ore" on a held item of the given plank, and tell me if they're listed as "plankWood" in the ore dictionary. 2. Run "/ch hand material" and check if they're "wood" likewise. 3. Are you using any mods which mess with the wooden log to plank recipe? Ahh, that last one would be it. I've got Survivalist installed. Though, it is a bit odd that quark colored planks and vanilla woods are unaffected. I saw your solution for that further down [mods.charset.MaterialRegistry.registerTypes(<mod:plank>, "block", "wood", "plank");], so I'll just go through them with a for loop in crafttweaker. Cheers. Yes. This is an unfortunate side effect of the way I do things. I can probably add explicit compatibility for Survivalist (and BWM), but if you can use CraftTweaker for now that'd be appreciated. Looks like tubes with a transposer will PULL things out of CHARSET chest IF the destination is a vanilla chest. If the destination is a CHARSET chest, nothing happens. Im not sure if this is an issue with Teckle or Charset so ill notify Asie as well. I noticed that quarks pipe's work fine with charset chest so im thinking maybe the issue is on teckle's side. For the maintainer: This may be related to the fact I only expose an IItemHandler and not an IInventory. btw: any plans or doing similar mod on other features like bookshelf and stuff? bibliocraft is kinda falling behind (the are not adding mod support anymore) and other mods i've try, have the decorative block (acacia, jungle, etc) but not mod woods (BOP, rustic) not the ability to interact with the enchanting table for instance.... minecraft required mods like yours for every item... so congratz on this one and i hope you make more like this! thanks for the answer. I posted a crash log into your github. But thanks for the quick answer. This mod has bookshelves made from different woods (including modded woods) I find its a nice replacement for bibliocraft for the time being. Any plans for trapped chests?